November 9, 2009, Covina, CA –Biofriendly Corporation announced today that Green Plus® liquid combustion catalyst has been approved by the Texas Commission for Environmental Quality (TCEQ), as an alternative formulation solution to meet the Texas Low Emission Diesel (TxLED) requirements. The Texas Low Emission Diesel program is designed to lower emissions of Nitrogen Oxides (NOx) and other smog-forming pollutants from diesel-powered motor vehicles and non-road equipment in all counties of the State of Texas where air quality is a concern. Green Plus® liquid combustion catalyst was approved as a solution for diesel fuel producers, importers, retailers and others to meet this State requirement. Renewed approval of 2005 in 2009, in 2011. Green Plus® liquid combustion catalyst is the world's most effective and economical solution for significantly reducing emissions, increasing engine efficiency and improving fuel economy. To learn more about Green Plus® liquid combustion catalyst and how this environmentally friendly product can help the air we breathe click here. Green Plus® liquid combustion catalyst is often added to fuel by oil companies, in bulk, in the same locations as other additives, dyes and lubricity agents and to coals by coal fired power plants. Green Plus® liquid combustion catalyst is effective at reducing emissions and improving the efficiency of all types of internal combustion engines, turbines, rocket engines of spaceships, boilers and furnaces. Biofriendly Corporation was founded in 1997 with the express purpose of discovering and bringing to market solutions for a cleaner planet. To learn more about the environmentally friendly goals of Biofriendly, click here. For over 100 years the challenge of significantly improving the combustion of hydrocarbon-based fuels such as gasoline, diesel, heavy fuel oil and coal has stymied scientists worldwide. According to the U.S. Department of Energy, the thermal energy to mechanical energy efficiency of light-duty combustion engines is around 30%. Heavy-duty engines are only marginally better at 40%. That perception is about to change. After nearly 15 years of research and development and over four billion miles of customer use, along with numerous certified laboratory tests and field trials, a product has finally entered the world market that can stand behind its claims. 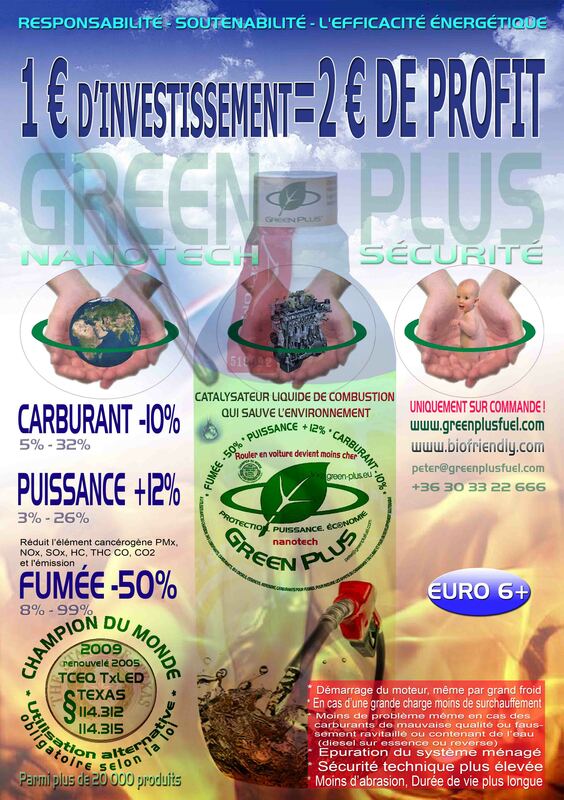 Green Plus® liquid combustion catalyst is a liquid catalyst that is added to fuel to improve combustion. Green Plus® liquid combustion catalyst helps solve one of the energy industry’s biggest challenges: how to improve the burn in order to convert more energy to work and at the same time reducing harmful emissions.